As part of a child's education, STEM (science, technology, engineering and maths) subjects are recognised for their importance in preparing children for the increasingly technological world that we live in. 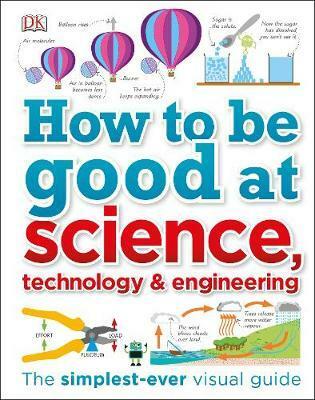 The new Dorling Kindersley (DK) book, How To Be Good At Science, Technology and Engineering, explores three of the STEM subjects. Each science, technology and engineering (STE) concept is presented using the correct terminology with age appropriate language. This DK book is jammed packed with interesting facts from: the human eye to telescopes, magnets to space, volcanic eruptions and rocket power. How To Be Good At Science, Technology and Engineering's information is supported with illustrations, colour coded numbers, labels, graphs, and diagrams. This book will be a great edition to a home or school library. It is the type of book that is easy to dip in and out of for homework or to expand on the knowledge of the inquisitive child. Other DK Books for curious children include: The Bacteria Book, 100 Scientists Who Made History and 13 1/2 Incredible Things You Need To Know About Everything.